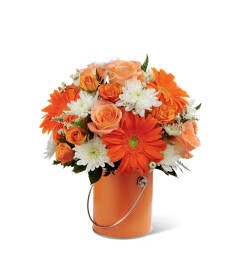 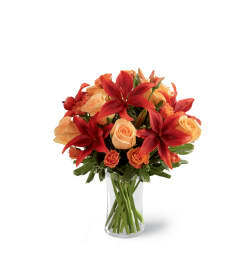 The FTD® You're Special™ Bouquet is a warm expression of flowering beauty set to send your sweetest wishes to your special recipient. 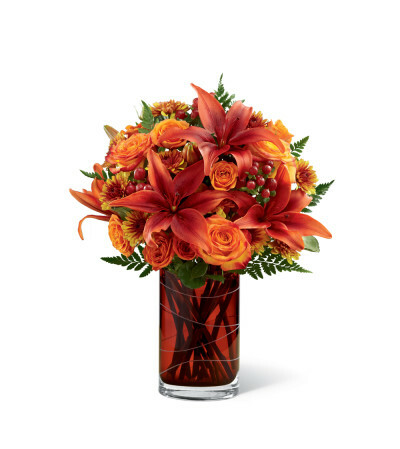 Eye-catching orange roses and spray roses are brought together with rust colored Asiatic lilies accented with bronze chrysanthemums, red hypericum berries and lush greens to create an exceptional flower bouquet. Presented in an exquisite designer chestnut-hued etched glass vase boasting sophisticated lines and a unique styling, this flower arrangement will make the perfect gift to send for Grandparent's Day, Thanksgiving or a fall birthday.